We concluded this year’s thematic workshop cycle within the School of EU Integration with workshops and lectures on security and local economic development. Our attendees talked about the security situation on the north of Kosovo and the potentials for local economic development and social entrepreneurship with experts. A workshop on the role of Area of Freedom, Justice and Security was organised in Kosovska Mitrovica, on Friday, November 23rd. 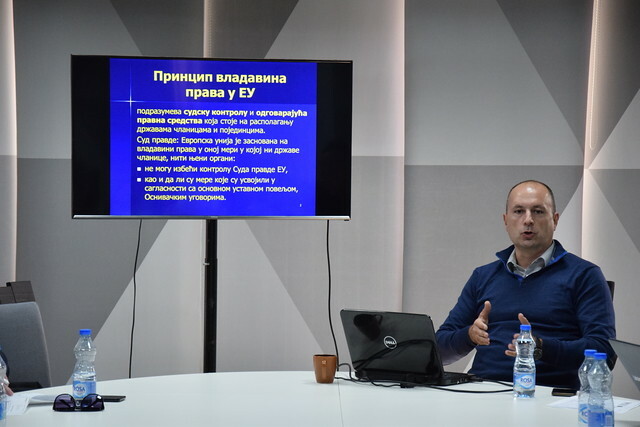 Attendees discussed the Chapter 24 reform process and the role of CSO as well as police integrity assessment with Bojan Elek, researcher at the Belgrade Center for Security Policy. The second part of the workshop was focused on applying the knowledge acquired on a concrete example of European Commission recommendation and the creation of a shadow report. On the second day, attendees talked to Plator Avdiu of the Kosovo Center for Security Studies on security issues in the north of Kosovo. SEI attendees in Gračanica had the chance to learn more on social entrepreneurship as a driver of local development with Dina Rakin from the European Movement in Serbia as part of the sustainable development module. At the beginning of the lecture they discussed differences between a social economy and the economy in socialist times. Dina Rakin pointed out that it is important to have in mind that social entrepreneurs bear profit in mind – but that excess profit goes to solving a social issue. Attendees pointed out that Gračanica had a social incubator where there was involvement from all interested parties, with the idea of producing authentic output. It was evident that it is very difficult to find sustainability for this mode of production in practices, since the social incubator shut down soon after the project has finished. Conversations in the second part of the workshop concerned the basic concept of local economic development by Arsim Nimanaj from the CREATE Foundation. On the second day Branka Perović, Regional Development Agency of Kosovo and Metohija President and RARIS Vladan Jeremić held a lecture on cross border cooperation in the context of local economic development and the final lecture on the sustainable development of Kosovo, was held by Ljubiša Mijačić. The next planned activity is a study visit to Belgrade on the 6th and 7th of December where attendees will discuss with civil sector representatives, visit the National Assembly of the Republic of Serbia, the Ministry of European Integration and, for the very end of the study visit, meet with NCEU representatives. The Kosovo Foundation for Open Society, in cooperation with the European Movement in Serbia and the NGO AKTIV , started the School of European Integration in 2014 key stakeholders in north Kosovo*. In 2018, Communication for Social Development from Gračanica joined the project team which will contribute to the expansion of the School achieving better results in other local communities. Find more info on the project here.